The EC members decided to take advantage of the ISNA West Education Forum to augment the attendance of Arabic language teachers, administrators, and community leaders, and to introduce the EC members. In addition, they sought to publicize SCALTC, and show that Arabic language teaching has support from QFI and other government entities. The luncheon was a great success. We tripled the number of members and raised awareness about the importance of the SCALTC. The executive committee members, the co-chairs of the EC, and the program coordinator were present at the luncheon. 190 attendees joined us for the luncheon. The attendees were a combination of Arabic language teachers, school administrators, teachers of other subjects, board members, community members, and the organizers of the conference. It is crucial for us to be visible at local conferences, increasing recruitment, of members and highlighting for administrators the importance of teaching Arabic as a world language. Arabic teachers felt supported by other colleagues. Session 1 - Invite Them, Excite Them, They'll Learn! Synopsis: Keeping students involved and engaged is key for a successful lesson. In this session, participants will examine few tips and explore some activities that will insure students are captivated and excited about learning. These activities will provide a class environment where students are moving around, working in groups, and discovering new information, all by using the language! Session 2 - Keeping Up the Momentum: Dynamic Activities to Motivate Learners. Synopsis: Students come in different shapes, sizes and learning styles. Presenter will share activities that address different learner’s styles to keep all learners in your class motivated and driven. Participants will learn how to change the daily mechanical drills into interactive and appealing activities. 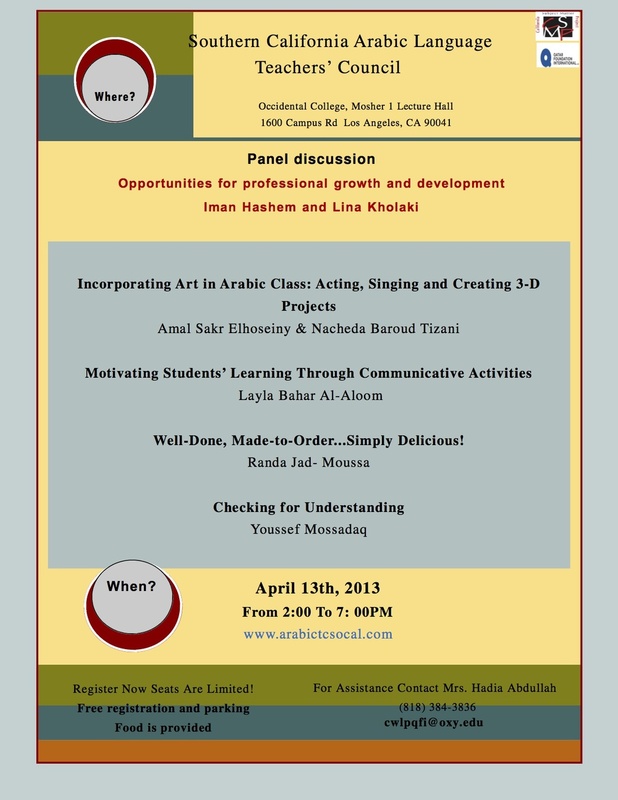 Session 3 - Exploring Arabic through Technology and Visual Arts. Synopsis: This Exciting workshop will demonstrate to participants how Arabic can be used in interdisciplinary projects to increase student engagement and improve proficiency. Session 4 - In or Out: Rethinking Flashcards for Vocabulary and More! Synopsis: Learn all about electronic flashcards! Create your own and help students retain more vocabulary and expression, and even grammar by using this exciting tool inside and outside of the classroom. View the Presentation Here & View Video Tutorial Here. Synopsis: This session is a general session for all attendees of the SCALTC event. In this session, participants will explore various opportunities available for Arabic language teachers’ professional certification and development. Presenters will walk participants through the steps of obtaining the California K-12 teaching credential for Arabic language teacher. In addition we will provide information available about face-to-face and online professional development programs and webinars and describe ways for networking. Additionally, participants will have the opportunity to ask questions and listen to various teachers’ experiences about the topic. Synopsis: Art can be used in many ways in the language class to enhance the learning skills of the 21st century students. It can be incorporated in students’ homework, classwork and assessment. Presenters will share several project ideas and some ready-made materials to be taken and used immediately in class. Synopsis: Participants will learn and variety of communicative activities which will assist their students during weekend and daily school in learning the Arabic language. They will also learn how to choose the right activities that engage their students. These activities will motivate the learners to use the target language. Parallel Session 3 - Well-Done, Made-to-Order ... Simply DELICIOUS! Synopsis: Find and share resources and create your personal learning network with this easy to use technology tool. View the Presentation Here & View the Video Tutorial Here. Synopsis: This session presents the rationales of “Checking for Understanding”. It also highlights the importance of the ongoing formative assessment techniques in a language class and their immediate positive impact on students’ efficient learning. The session suggests alternative classroom activities that teachers can use to enhance their instruction and support their students’ learning.